If you are like me, certain questions keep you up at night. 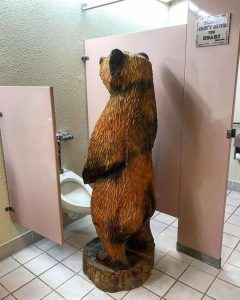 This is one of them, “Do bears use restrooms?” Take a backroads trip on the Billy The Kid Scenic Byway in New Mexico, one of America’s best backroads trips, and find out! Lore from when the west was more wild with shoot-outs, posses and jail breaks are stories Stu and I truly love. Colorful people are our favorites and the old west had plenty! We can’t get enough and had no idea that the Billy the Kid Scenic Byway and New Mexico is home to so many legendary sights and characters. At the Billy the Kid Scenic Byway Visitors Center (billybyway.com) (1461 US 70 West, Ruidoso, NM), Stu was stunned by what (or should I say who?) was in the men’s room! Explore America’s past on this Byway! It is fascinating! When you take the 84-mile drive through Lincoln County, New Mexico, you see the old American West and historic footsteps. Just think, the likes of Billy the Kid, Pat Garrett, the Mescalero Apache nation, Kit Carson, “Black Jack” Pershing, the Buffalo Soldiers, and “Smokey Bear” all walked here. This backroads trip follows the million-acre Lincoln National Forest. You’ll see plains as well as pine forests. Drive up the 12,000 elevation of the Sierra Blanca mountains and visit Fort Stanton on the plains. A backroads trip to San Patricio is well-worth it! It was the site of the battle between Billy the Kid and the Regulators and Sheriff George Peppin and his posse. There are many historic sites in San Patricio. Approximately 12 miles southwest of San Patricio on Highway 70, is the Ruidoso River Museum, which has many Hondo valley artifacts. Legendary Americans are buried in New Mexico (http://www.onlyinyourstate.com/new-mexico/graves-wild-west-legends-nm/). The Lincoln Cemetery is five miles north of San Patricio and is the final resting place of two of Billy the Kid’s fellow outlaws, Jose Mantano and Ygenio Salazar. Sheriff Peppin is also buried at Lincoln Cemetery as is Saturnino Baca, who fought against Billy the Kid and persuaded Lt. Col. Dudley to bring troops to Lincoln County to fight the Kid. To reach the cemetery, drive two miles west on Highway 70 then 3 miles north on Highway 380. The Billy the Kid Visitor Center sheds a different light on the life of Billy the Kid than our common understanding. Learn about the early life of Henry McCarty, later William H.Bonney. The real story of the Lincoln County War and the Kid’s involvement may surprise you. The Visitor Center is next door to the Hubbard Museum of the American West.The Hubbard Museum is an affiliate of the Smithsonian and contains The Anne Schley collection of carriages, wagons, guns and Native American history. While the Hubbard says it is open every day, please call first (1-505-378-4142) to confirm. Billy the Kid Visitor Center Ruidoso, New Mexico. We had a blast driving the Billy the Kid Scenic Byway!